Here we have a case of researching one incident and finding connections you never expected, as with the accused Boston Bombers' uncle Rusland who himself, now we find out, happens to have close ties to the CIA. No wonder he was so quickly available to offer condemnation against his nephews, conveniently giving full support to the allegations they were the culprits, fitting neatly with the official story. 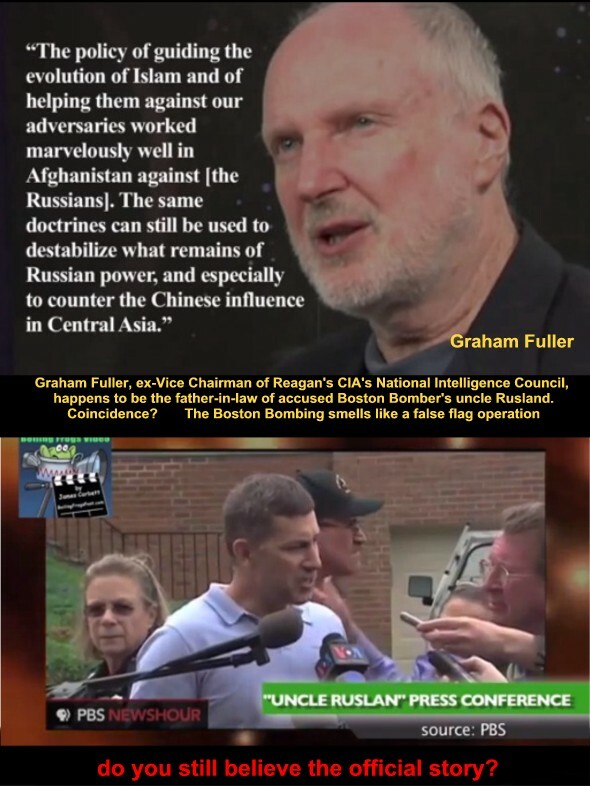 Graham Fuller, his ex-father-in-law is still active in the current affairs and was in charge for the CIA, of the very area where Chechenya is located. His daughter married Rusland and after the divorce, the son in law lived with her father Graham Fuller for a year. Uncle Rusland operated the "Congress of Chechen" from the very same address as the ex-CIA operative's home. Too many coincidences for comfort.​ Fuller's attempt to dismiss the suspicions as "absurd" are the logical response from a veteran spy.